The Digitized Ramblings of an 8-Bit Animal: Borderlands 2 = LOOT!!!!!!! In October 2009, GearBox and 2K Games released a video game that a lot of people overlooked initially. They released Borderlands which was a First Person Shooter with RPG elements built in. It was a well put together game that left the gaming community anticipating the sequel. Move the clock forward three years and Borderlands 2 has come out just in time for the holiday season. Borderlands 2 adds new playable characters, an actual villain, and the one thing that made the first Borderlands such a fun game, LOOT!!!!!!!!!!!!!! When you first start playing Borderlands 2, you have to decide which character class you will choose. The class choices are Siren, Engineer, Assassin, Mecromancer, and Gunserker. Each character has a different talent that you unlock at level 5. Every time you level up you get a skill point to assign to a different skill tree. Each character has 3 skill trees that vary depending on the character. After you have decided on your character class you start the game and are immediately introduced to the antagonist of the game. Unlike the first Borderlands, this game has a clear villain. His name is Handsome Jack, and he spends a lot of time verbally harassing you. The whole story revolves around you trying to stop Handsome Jack from gathering Eridium and awakening “The Warrior”, a mystical entity that can destroy the world. During your play through you will encounter characters from the previous installment that are there to help you on your journey. Also different areas that you visited in the first game make an appearance in this game as well like Fyrestone, which was the place you first visited at the start of Borderlands. While there is a lot going on with the story, what keeps Borderlands 2 as a huge game are the plethora of side mission. The good and sometimes bad idea about having a lot of missions is that they have a chance at becoming repetitive, but there are such a variety of missions that you will never get bored playing them. Gameplay in Borderlands 2 is very streamlined and simple. If you have played a First Person Shooter before, then you have an idea at what the button layout is. While Borderlands 2 is a very good single player game, it is best played with a group of people online. Up to 4 players can play together in an online Co-Op game and fight the good fight to defeat handsome Jack. 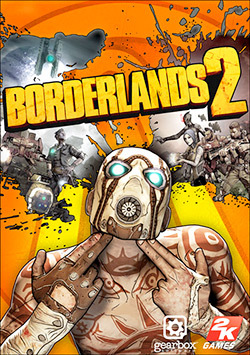 The Co-Op aspect of Borderlands 2 was the major selling point to this game. Adding more players to the game not only increases the difficulty of the enemies you are facing, but it also gives you better loot, whether it is Grenades, Shields, Guns, Relics, or Class Mods. Nothing is more pleasing than trading loot with your fellow players. Maybe one player is better at using a Sniper Rifle where as you are better with Shotguns. This allows you and your team to play to each other strengths. Overall Borderlands 2 is a great game, but it is not without its flaws. During my pIaythrough I experienced a lot of texture pop-ins when entering new areas and opening containers. Also during my initial playthrough I received a lot of fire elemental weapons, which isn’t a bad thing, but a vast majority of enemies I faced were fire resistant. These problem may vary depending on your console (Xbox360 or PS3), but they are small problems and do not take away from the game itself. I would say if you are looking for a great FPS with RPG elements attached, and gameplay that keeps you wanting to continue playing, then I would suggest you pick up a copy of Borderlands 2. Being that this game recently came out; it will run you about $50 - $60. If you can afford it, pick up a copy next time you see one.